Applebees Queso Blanco is a favorite appetizer of so many. 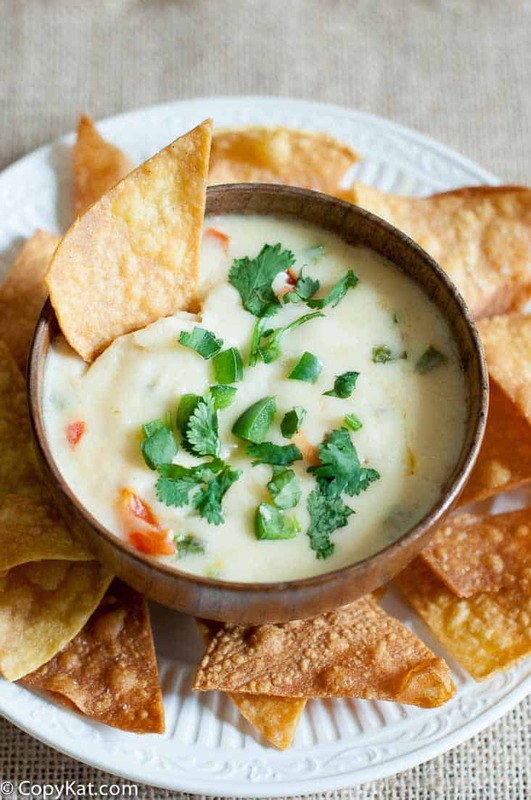 This white queso recipe is smooth, creamy, and has just that little bit of spice. White Queso dips, or queso blanco may at first seem like a mystery, I promise, it isn’t. A quick trip to the deli and you will be in the queso making business. I don’t know why, but white queso seems to be very perplexing. Many of the cheese sauces you find in restaurants have American cheese as their base. Before you recoil in horror consider that American cheese has its place. Quite honestly it does a fantastic job of melting and making cheese sauces. You may not have known it comes in the very familiar yellow variety, but it also comes in the white variety, and it is the base of these cheese sauce. What makes this copycat recipe special is that we are using fresh onions, jalapenos, and tomatoes to give this queso its added flavor. Nothing is canned, but this queso has its spice from fresh jalapenos. When working with them you may want to wear some gloves, they can burn your fingers. If you like your queso hot you can add more chopped jalapenos. You could also not seed them and get a little more of that spice. I served this recipe up with some corn chips, but honestly, I think this queso would taste great spooned over enchiladas, or even served over a fresh chimichanga. When serving queso at a party I like to put mine in a Fondue Pot. This way the queso stays nice and warm the whole time. Looking for more Applebees CopyKat Recipes? Be sure to check out these copycat Applebees recipes. You can recreate Applebees Queso Blanco at home. In a medium sized pot over low - medium heat add vegetable oil, 1 1/2 tablespoons chopped jalapeno pepper and white onion. Saute onion and peppers until the onion becomes translucent. Chop cheese into large pieces, add all cheeses and half and half. Reduce heat to low and stir the cheese so it melts.When all of the cheese has melted add the fresh tomatoes, stir the tomatoes in. Stir in half of the cilantro. Just before serving garnish the queso with remaining cilantro and chopped jalapenos. Hello Stephanie, I just came across your copy cat recipes and soooooo hope you can help me. My boyfriend and I were at Disneyland in March and stopped to eat at the Splitsville restaurant in Downtown Disney. We just loved their loaded fries especially the white Queso Blanco sauce that was on these fries. Is there a recipe you have for them ? Thank you for your note. I am sorry I haven’t tried this one. I would base the queso you loved off of this one. If it is a white queso the base is likely an American White cheese. Land o Lakes is a very popular foodservice brand. I don’t know how it was spiced. All available recipes are currently online. Absolutely love the white queso that qudoba serves. Are these two sauces the same ? This is one of my husbands favorites! I can’t wait to try this!!! Thank you so much! Keep the recipes coming! I hope he enjoys the dip! Hi! I just stumbled on your website recently and have been working my way through the recipes. My husband loves Applebees’ Pretzel and Beer Cheese app. Any plans on crafting that one? What brand cheese you use and I have only seen slice white American. I use Land of Lakes cheese, you can buy it in the deli section of the grocery store. I will be making this as soon as possible. Thank you for sharing all your wonderful recipes. Could this be made in a crockpot? You could make it in a small one. Thank you very much! I love appetizers. Olive Garden Fried lasagne please TY. I LOVE Applebee’s queso! This is fantastic! Thank you! I am glad you enjoyed the recipe. Oh No! My diet just went to hell.